The definition of a shipping box is a container where you can ship products, or move objects from one place to another, while protecting them from getting damaged. Shipping boxes, to the naked eye, are a simple cost that allows you to get your product to your distributor, retailer or consumer. However, there are very many different types of shipping boxes that might suit your business. There is choice and variety. It is important to speak with packaging professionals in order to educate and allow yourself to make the right decision when planning your packaging strategy. 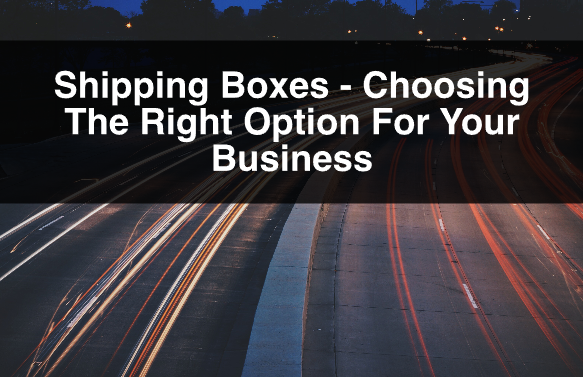 There are many factors to consider when choosing the right shipping box for your business. Always keep in mind your product and think about what it takes for it to arrive safely to its destination. There are many factors that comes into this equation. Think about the size and weight of your product. With this, consider the size of the box and the sturdiness of it. The most common type of shipping box is the RSC (regular slotted carton) box. This box is versatile and comes in all different types sizes. It is important to plan the amount of product you are willing to ship per order, in order to maximize space. By doing this you are ensuring that with every box there is no waste in space. Having the right size of box will ave you money when it comes to transporting your goods. As mentioned earlier, there are many different sizes of boxes, and boxes per order. Perhaps you are transporting products that are very heavy. Think about the material of the box and if it is going to stand your product’s weight. Remember, the main purpose of these boxes is to ensure your product gets to its destination protected and undamaged. The cost with these different types of boxes vary with the amount ordered, the material being used, how custom the order is etc. While some people think they are wasting money in looking into this cost consideration, others are, in fact, saving. Plan properly to ensure you have the best option for your shipments. Consider branding your shipping boxes. As we have mentioned in older posts, branding can be a form of advertising through the shipping cycle. The more people see, and like your box, the more likely they are to choose your product over your competitor’s. Custom graphics are a great way to add value to your shipment. There might be many individuals that handle your shipment, and these individuals might be part of your target audience. For more information, or questions about shipping boxes, moving boxes or RSC boxes please contact us. Also, sign up to our newsletter for more information, company updates, price specials, and more.